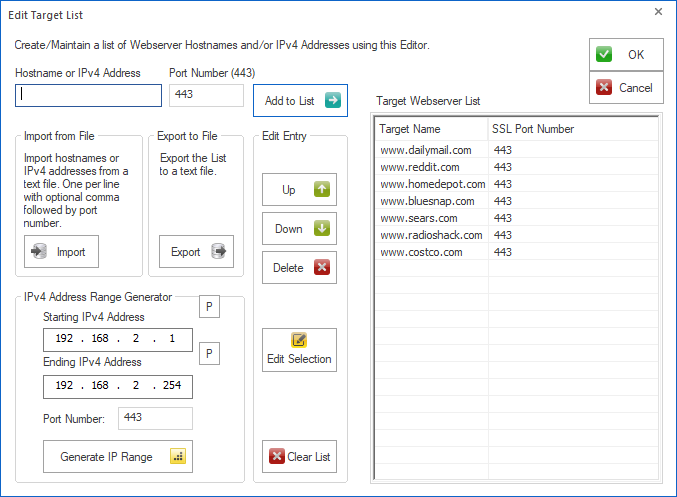 This standalone tool for Windows can retrieve and examine web server SSL certificates from a list of servers and test the servers for supported encryption connection methods. 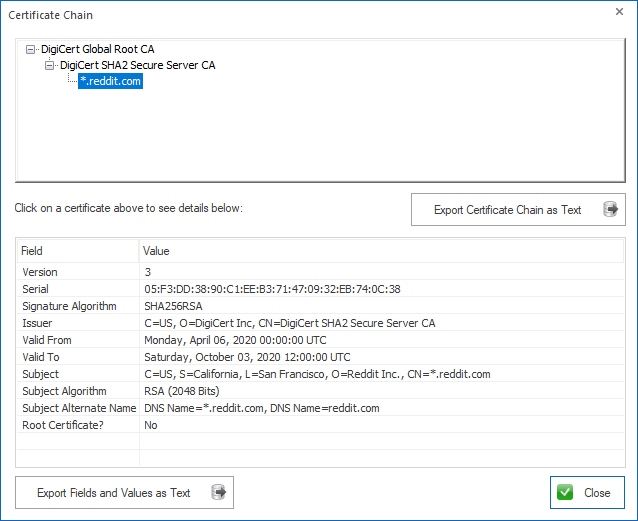 Retrieves the web server SSL certificate (https) and shows important aspects of the certificate like start and end date, validity, signature algorithm and the certification path to the root certificate. All certificate fields can be exported. Version 2.60 was a fairly major update with the added ability to specify a web server SSL port other than the standard port 443. Tests the web servers for the five common secure connection methods (SSLv2, SSL3, TLS1, TLS1.1, TLS1.2) and identifies servers allowing weak connection methods like SSLv2, SSLv3 and TLS1. The bit level of the strongest supported method is shown. Note: as of Jan 2019 Windows SCHANNEL does NOT support TLS1.3, so we cannot test TLS 1.3 connections. These screenshots show the app in action. This is the main app window after completing a scan of a list of web servers. In this case they are all publically available websites, but you could also scan internal sites or IP addresses. This is the Certificate Chain display window. You right click on a server in the main window to get here. This is the Target List Editor. You can manually enter websites or IP addresses. You can import them from a text file or generate a range of IP addresses to scan. Download the 14 day trial here (6 MB). Requires Windows 10, 8.1, 7, 2016, 2012, 2008.